Ranolazine treatment improves whole-body oxygen consumption rates in obese mice. (A and B) Twenty-four–hour (light cycle from 0–12 hours; dark cycle from 12–24 hours) and average whole-body oxygen consumption rates in lean and obese mice treated with either vehicle control (VC) or ranolazine (Ran) (n = 5). (C) Average whole-body carbon dioxide production rates in lean and obese mice treated with either VC or Ran (n = 5). (D and E) Twenty-four–hour (light cycle from 0–12 hours; dark cycle from 12–24 hours) and average respiratory exchange ratios (RER) in lean and obese mice treated with either VC or Ran (n = 5–6). 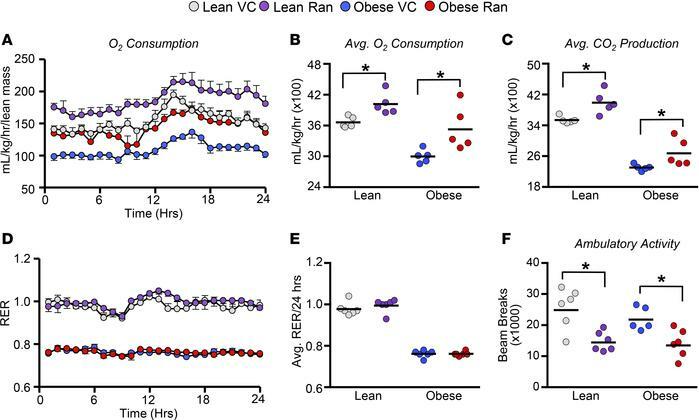 (F) Twenty-four–hour ambulatory activity in lean and obese mice treated with either VC or Ran (n = 5–6). Values represent means ± SEM. Differences were determined using a 2-way ANOVA, followed by a Bonferroni post hoc analysis. *P < 0.05, significantly different from VC-treated counterpart.